Countdown the days to UCLA’s season-opener against Texas A&M with key stats facing the Bruins this year. Thomas Duarte was UCLA’s main red zone target last season as he led the team with 10 receiving touchdowns. The hybrid receiver gave up his final year of eligibility in favor of the NFL, which left a gaping 6-foot-3, 221-pound hole in the UCLA offense. Other than Duarte, no Bruin caught more than five touchdown passes from quarterback Josh Rosen. Jordan Payton was second on the team with five, followed by three from Devin Fuller. Both are now in the NFL. Of UCLA’s returning receivers, only Darren Andrews and Kenneth Walker III caught a touchdown pass, each hauling in one last year. Running back Nate Starks also caught one last year. 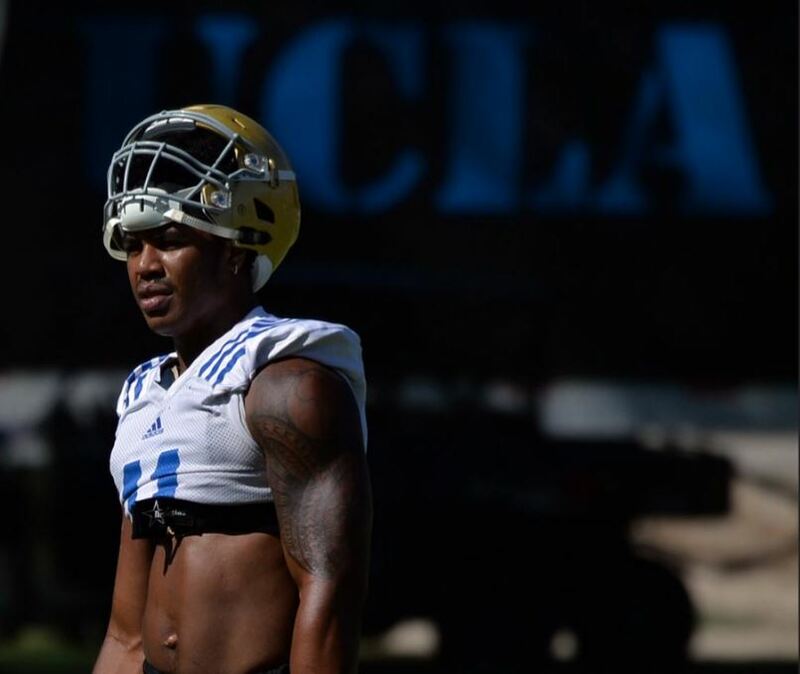 While the entire receiving corps focuses on finding a replacement for Payton, the UCLA leader in career receptions, the tight ends could also help fill Duarte’s production. Tight end Nate Iese emerged as a receiving threat for the Bruins during training camp and could be a good target for Rosen. Freshmen Caleb Wilson and Jordan Wilson also impressed during fall camp. At 6-foot-4, 250 pounds, Jordan Wilson provides a big target that UCLA hasn’t seen in recent years at tight end, head coach Jim Mora said. This entry was posted in Football and tagged 2016 season preview, Caleb Wilson, Jordan Wilson, Josh Rosen, Nate Iese by Thuc Nhi Nguyen. Bookmark the permalink. Can we do a pool when Mique is found on the UCLA campus? I say over and under is never. You must love USC. You’re a funny guy. Go ahead and cheer for your nationally recognized university. I’ve been to every continent on this planet (including Antarctica) and there is one consistent thing (outside of Antarctica). Nobody knows where or what USC is. However, UCLA I’ve seen as a name brand that is respected everywhere. This I can say with confidence. I was in a remote part of Greece last summer, and what did I see? A couple from Australia wearing UCLA gear. Why is that? Why weren’t they wearing USC crap? It has something to do with a respected education. Or In USC appropriate words estoy action. Ask me where else I’ve seen this? Oh all over Europe, Central and South America, Australia, New Zealand, Asia, North Africa. I think the only place I’ve been where I’ve seen otherwise, is American Samoa, because of Troy polumalu. It’s different in Samoa though. So keep on edumacating yourselves over there in clownville. No need to respond to him. He can’t read. Hawaii is busy trying to string together another clown hashtag. Although I don’t always agree with your posts, I do respect that much of the time your responses are well researched and somewhat indicative of past posts, comments and something of educated appraisals of truth, although you are a USC fan. Im not a fan. I’m a Bruin! I’ve been watching you all and your banter for years, and finally decided to post. I got fed up with this guys crap. You use to run under different names I presume. This site needs more pick up. Thuc is a good writer. Thank god long are the days of Jon. That’s not really Laker Rod, it’s his parody account. If the post is less than 500 words and grammatically correct, chances are it’s not him. This faker laker likes to come on here and get negative about everything. Just ignore him. You guys are hilarious. This couldn’t have been better scripted by a comedic writer. Faker Laker. You’re making a complete fool of yourself and your fellow Bruin fans. Imagine a freakin’ UCLA fan imitating another poster. As long as Lee Corso remembers USC that’s all that matters. You would have the inside track. He is still entertaining Mrshawaii. Mique needs time to adjust to being just another LB among a stable of very good LBs. Lokeni is ripping it at practice. Whatever Mique chooses to do with his future, I certainly wish him all the best.